What if the greatest conspiracy theory of all time became reality? A take-over of the United States government could never happen…or could it? Secretly appointed by Congress and housed underground at FEMA’s Mount Weather facility, members of the Continuity of Government initiative prepare to carry on government functions in the event of a catastrophic national emergency. Agent Dan Chavez will do whatever it takes to prevent the intricate plan from reaching the inevitable, unthinkable end—a power grab that would be the greatest political coup in history. But will he be able to stop McGuire and THE SHADOW CABINET from seizing control of the most powerful country in the world? “This political thriller sends chills and shudders skittering all over the body—goose bumps, prickly hair, and breath-catching moments. The Shadow Cabinet is hard to put down when once started for fear the “bad guys” will get away with their horrible plans if left alone. Of course, trying to separate the “bad guys” from the “good guys” is no easy task—lots of shades of gray between the distinct black and white. . . Ms. Marshall has created a political thriller that comes alive like today’s news, making one hope the “good guys” keep winning. The Shadow Cabinet is a smart mystery thriller that will have you sitting on the edge of your seat. There were even a few moments where I found myself thinking, “No don’t do that!”, which, in my opinion, is great writing. 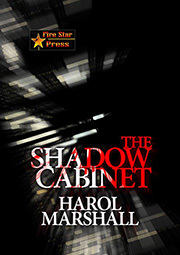 Author Harol Marshall has created a great conspiracy. I love the diverse set of storylines as different characters discover pieces to the puzzle as they work on their own assignments. My favorite part of the book is the two kick a**, strong female characters. These ladies don’t need a stinking hero; they are heroes in their own right. It was quite refreshing to see females play a key role in stopping this conspiracy.